Who could have foretold that the folktales Jacob and Wilhelm Grimm collected and first published in 1812 would still be firing the imagination of writers, artists, composers, and film directors across the universe? The dazzling artwork inspired by the potent tales takes center stage in The Fairy Tales of the Brothers Grimm, a handsome new heirloom-quality compilation. This book is a treasure to touch and to behold. A royal purple cloth cover provides the background for the gold-stamped title and an image of a brightly beribboned Sleeping Beauty. Inside, the end papers sprout dreamily winding white vines that precede a radiant full-page illustration by the renowned Danish illustrator Kay Nielsen. Even the table of contents is a gorgeous affair, sprouting a fanciful font and a small, symbolic silhouette atop each entry. Inside, wonders lie in wait. Recognized by the poet W. H. Auden as “among the few indispensable, common-property books upon which Western culture can be founded,” the tales still bristle with energy and magic. Ms. Daniel has chosen 27 appealing stories from the 1857 edition, which included the brothers’ revisions designed to make the stories more engaging and suitable for both young and old audiences. The new translations by Mr. Price hew closely to the Grimm brothers’ versions, resulting in tales that tremble with humor and embrace the chiaroscuro of human experience. The lavish presentation of each story includes a brief, interesting introduction by Ms. Daniel, a golden page featuring a lively silhouette either vintage or newly commissioned; and then both full-page and spot illustrations. 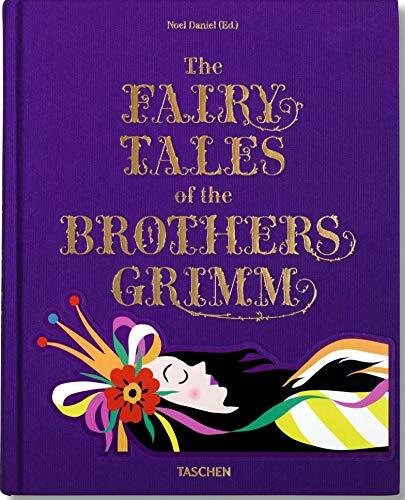 Arranged in the order in which the Grimm brothers published them, the tales seem both fresh and familiar. Such favorites as “The Frog Prince,” “Hansel and Gretel,” and “Rumpelstiltskin” are here, but the versions veer from many of the sanitized plots widely published. This “Cinderella,” for instance, is no passive Barbie; instead, she’s a tenacious young woman who works to create her new destiny. She has no fairy godmother; instead, she prays at the hazel tree planted at her mother’s grave, and birds come to her aid. “Dear little tree,/Shake your branches and flutter your leaves/And let gold and silver fall down over me!” That’s how she gets her shimmering evening gown and slippers embroidered in silk and silver. She doesn’t need a pumpkin; she dashes off to the ball on her own, thank you. After Cinderella and the prince dance for hours, she needs no clock to tell her it’s time to go. When the smitten young man insists he will accompany her home, she gives him the slip. Twice more this happens, until the prince wises up and orders the staircase covered in pitch. This time when Cinderella runs off, her golden slipper gets stuck. The gory measures the stepsisters take in order to force their feet into the shoe belonging to the prince’s true love will cause some adults to pause. The poetic justice meted out to them and their cruel mother at the end is also uncompromisingly stark. Adults may need to decide whether to discuss the symbolic nature of the tales or simply to omit the violence when reading aloud to children. Further, this important volume gives readers opportunities to discover some lovely tales that deserve more attention. “Little Brother and Little Sister” is a touching, sometimes humorous story that is as resonant as the somewhat related “Hansel and Gretel.” Most teens and adults would enjoy the stirring love story of “Jorinda and Joringel.” And why have not more people heard “The Star Coins,” which beautifully demonstrates the power and wisdom of generosity. If nothing else, the crisply reproduced illustrations in this compilation should lure people further into the Grimms’ enchanted forest. Defying the fairy-tale theme that appearances are deceiving, an astonishing range of images created from the 1820s to the 1950s enlivens these pages. The expected stars shine here: the British illustrators L. Leslie Brooke, Walter Crane, Arthur Rackham, and the quirky George Cruikshank, who illustrated the first English translation of the Grimms’ fairy tales. Acclaimed American artists include Wanda Gág (“The Fisherman and His Wife”) and Jessie Willcox Smith, with her radiant heroine for “The Goose Girl.” The fantastical illustrations of Nielsen grace three stories here. Most readers will delight in poring over the magical Old World artwork of the German illustrators Gustav Süs (“The Hare and the Hedgehog”) and Otto Speckter (“Rapunzel”). Wildly different from those are the witty, cartoonish color lithographs for “Puss ’n Boots,” done in 1946 by the Swiss illustrator Herbert Leupin. While the bright images add a whimsical touch, it seems a shame this fine edition stops mid-century, thereby excluding the fine work of such acclaimed illustrators as Paul O. Zelinsky, Jan Piénkowski, Trina Schart Hyman, Gennady Spirin, and Lisbeth Zwerger. Or perhaps the reviewer simply wishes for more magic than a book can hold. Adults and scholars will find much to enjoy both in the editor’s insightful introductory essay and in her concise, interesting biographies of the artists. Who says all that glitters is not gold? This stunning collection should live happily ever after with many a reader—young and old.